Traditional musical theatre blasts into the future with writer and rabble-rouser Joe Iconis and his band of musical theatre punks. On the heels of a runaway success (Joe's Be More Chill heads to Broadway next year). Join Joe and his merry band of musical theater punks as they roar their way through a set of Joe’s incendiary songs. Expect classic tunes, new numbers, and works-in-progress. Spill a drink, make a friend, and spend an evening with a tribe of artists determined to bring along their traditional musical theater Family Values as they blaze into the future. New York City Twisted Holiday Tradition celebrates its Tenth Splendiferous Year! Joe Iconis and his merry band of musical theater punks are proud to bring their insane celebration of all things red and green back to Feinstein’s/54 Below. Joe Iconis returns to the Beechman with his Frightening Family of musical theater goblins for their sixth annual Halloween Special!. 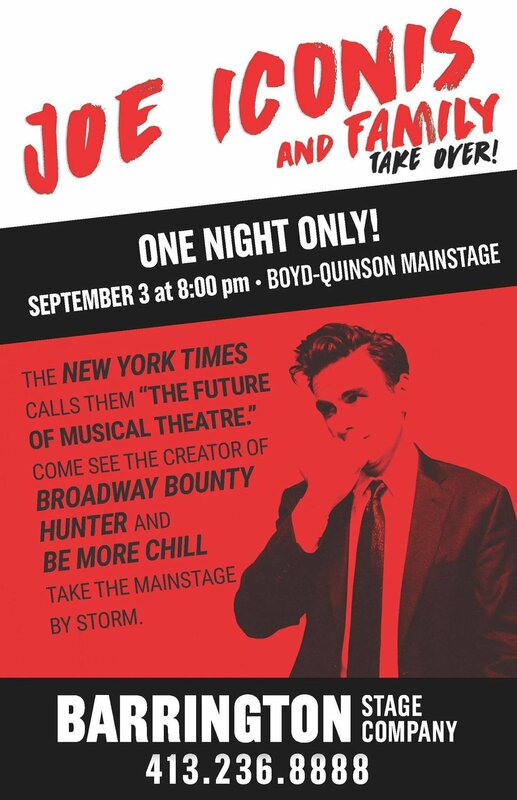 After many summers of blowing the roof off of our cabaret, Joe Iconis and his tribe of musical theater misfits are taking over the Barrington Stage Company Mainstage on Sunday September 3rd at 8:00pm in Pittsfield, MA. These musical mavericks will make it clear why The New York Times calls them “The Future of Musical Theatre” with songs about anything and everything that make you laugh, cry, scream, or drink. Come see what happens when The Family gets out of the basement and is set loose on the Mainstage for our final blowout of summer!